Kumarakom - The Backwater Retreat ! This is about a quick two days trip that I made to Kumarakom late August. 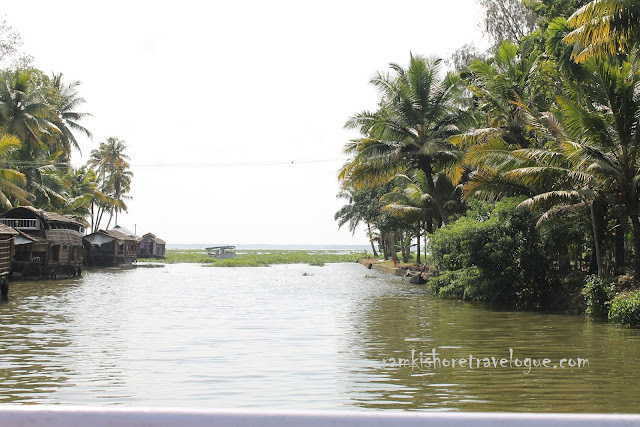 I had traveled down to my native Tirunelveli to spend a few days away from the bustling Bangalore city and made time to visit Kumarakom well known for the splendid backwaters. I took Hapa Express Train early at 6 in the morning, that plies between Tirunelveli and Hapa, connecting Alleppy (aka Alappuzha) on its way. It took about 5.5 hours from Tirunelveli to reach Alleppy which is the nearest city (for my route) to Kumarakom. It's the Vembanad lake that bisects Alleppy and Kumarakom. One can reach Kumarakom from Alleppy by Bus/Tax or Ferry. I had earlier planned to take a government operated ferry from Alleppy to Kumarakom. (You have to travel by Auto to reach the Boat Jetty from Alleppy railway station ~ 15-mins). I'm not sure if you could really travel by ferry from Alleppy boat jetty to Kumarakom, my earlier research on the internet suggested me to travel to Muhamma boat jetty (~18 Km from Alleppy Railway Station) to get to Kumarakom. Kerala, known for its frequent Bandh, was on strike that day too. (I believe this time the bandh was held by the people who ferry the boat). I had to either hire a taxi or travel by local inter city bus and I opted for taxi. Taxis to Kumarakom from Alleppy can cost anywhere between Rs800 to Rs 1200. It took nearly 45 minutes to reach Kumarakom. I had booked a room with Kodianthara Heritage Home in Kumarakom. It was already 2 Pm by the time I reached my resort. I zeroed in on this resort after reading a lot of reviews on the internet. I also chose this one for its value of money and I did not regret ! I enjoyed the ambience, food and hospitality shown by Crispin's Family. With Crispin beside you, you never have to worry about getting around Kumarakom. He's there to help you. Soon after reaching the resort, I was offered lunch in authentic Kerala style! With just a day and a half to spare, I planned to cruise through the backwaters on a motor boat (the reason why I came here) that Crispin had arranged . Ferries charge you around 400 per hour and it economical if you travel in groups. It took just 5 minutes by road to reach the boat jetty from the resort. Encountered quite a few house boats on the way. The trip across the Vembanad lake was rather boring. The lake was enormous and after a while you could only see water around you with resorts lining up the shore line. I requested the boater to take me through small villages usually connected with one another through narrow channels, lined with tall coconut trees either side. He did ! Videos taken at the Vembanad lake. After a nice 2.5 hours cruise, I headed back to the resort and called it a day. The Kumarakom Bird Sanctuary was first in my itinerary for the following day. Managed to wake up a bit early that day and took few snaps in and around the resort. Tapping toddy from the coconut trees. One of the many thoughtfully decorated interiors of the Kodianthara Resort. Had my breakfast at the resort and headed for the Kumarakom Bird Sanctuary. The Sanctuary is approximately 5 kms from the resort and I hired an auto who charged around 60 Rs. The Sanctuary is maintained by KTDC and has a tourist interpretation centre and boating. Couldn't see much of birds though, as It was already 11AM by the time I reached there and all the birds have already left for work (lol !). One gotta be there atleast by 7Am for bird watching. I decided to go boating once again, but this time on a much faster/smaller motor boat. I had to shell out a whopping 450 rupees for the boat, but it deserves every penny for the scenic ambience he took me through. House Boats docked along side. My position as seen on google map. Few more videos taken at the backwaters at Kumarakom. After all the fun, reached the resort just about noon, had lunch and packed my bags to travel back to my native. Took the state bus service from Kottayam town for my return journey. Kumarakom, really was a memorable journey !